Each year, Freedom Alliance presents the Edward J. Bronars Defender of Freedom Award during our annual President's Roundtable dinner. The award is given to an individual who exemplifies faith, courage and fidelity in the face of adversity. This prestigious award has proudly been presented to Captain Scott O'Grady, an Air Force pilot who survived after his F-16 was shot down and he was trapped for six days behind enemy lines in Bosnia; Mr. Ward Connerly, who, as a member of the University of California's Board of Regents, led the effort to end the University's use of race as a means for admissions; General Charles C. Krulak, Commandant of the Marine Corps who has established a standard of excellence in the Corps which makes this branch of the service second to none; and Congressman Bob Barr of Georgia who is a strong defender of conservative principles in the House of Representatives. The Defender of Freedom Award is named in loving memory and honor of Lieutenant Genreal Edward J. Bronars, a United States Marine. General Bronars served as the first chairman of Freedom Alliance. A true American patriot, his lifetime of selfless service in both civilian and military life embodies the spirit of Freedom Alliance. Ed Bronars was a graduate of the U.S. Naval Academy and his 32-year career with the Marine Corps included distinguished service in both the Korean War and the Vietnam War. His decorations and awards include the Silver Star, the Bronze Star, the Distinguished Service Medal and the Legion of Merit with Combat "V" for Valor. After his military retirement, General Bronars continued to serve his country as president of the Navy Relief Society and executive director of the Association of Military Schools and Colleges. During his service in the Vietnam War, General Bronars was then Lieutenant Oliver North's division commander. At that time a close mutual friendship developed between the two soldiers and, after General Bronars retired, LtCol North asked him to serve as chairman of the newly formed Freedom Alliance. At Freedom Alliance, General Bronars initiated several effective, action-oriented programs including Operation Homefront, a campaign which supplied over 125,000 care packages to the men and women serving in the Persian Gulf War. His leadership was instrumental in the significant role played by Freedom Alliance in defeating the Clinton administration's ill-advised policy to allow openly homosexual men and women to serve in America's military. He also provided crucial testimony before the Bush administration's Presidential Commission on the Assignment of Women in the Armed Forces. General Bronars served as chairman of Freedom Alliance from March, 1991, until our Lord called him home on September 6, 1996. 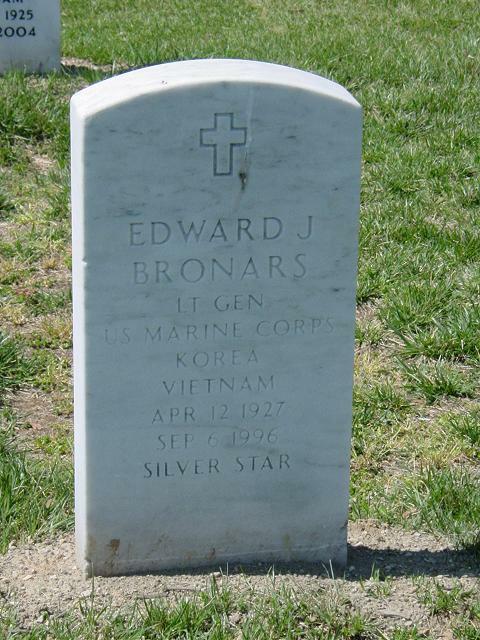 General Bronars now rests in eternal peace in Arlington National Cemetery. Many knew General Bronars as a great leader, a steadfast patriot and an honored war hero. The people of Freedom Alliance were blessed to know him as a dear friend.